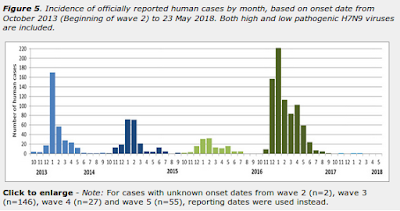 While we may not be getting all of the data out of China, the remarkable drop in reported outbreaks of H7N9 avian influenza since last fall (see chart below) - which closely follows last summer's nationwide deployment of a newly developed H7+H5 poultry vaccine - has to be viewed as a very encouraging sign. How long this lull will last remains to be seen, as antigenic changes in the circulating viruses - or the emergence of a new subtype - may eventually derail the vaccine's success. But for now, China's MOA appears to have hit a home run. The use of AI vaccines is not without controversy, and while China, Egypt, Indonesia, Vietnam and Hong Kong have embraced them, most countries around the world eschew their use. Aside from complicated international trade issues, the biggest concern is that most AI poultry vaccines are only able to suppress avian flu viruses to reduce morbidity and mortality in poultry, but they don't necessarily eliminate them. And as avian viruses evolve, over time existing poultry vaccines become increasingly less effective. Poor vaccine matches can then allow AI viruses to spread silently among flocks, to continue to reassort and evolve, and potentially lead to the emergence new subtypes of avian flu. Subclinical Highly Pathogenic Avian Influenza Virus Infection among Vaccinated Chickens, China). There are, however, some strong advocates for using AI poultry vaccines, who see their proper use as being the only reasonable course of action for countries where these viruses are firmly entrenched. Earlier this month I received a comment from Les Sims, who outlines his reasons in the following hour-long FAO webinar. Admittedly, the apparent success with China's recent vaccination program suggests that modern vaccines, when properly and consistently applied, can have a positive effect. But far too often, we've seen badly outdated, illegally obtained, and sometimes even home brewed vaccines used in the field (see Taiwan's Counterfeit AI Vaccine Trade). Vaccination coverage in many places has been spotty and intermittent, and the results have been less than satisfactory. In 2012’s Egypt: A Paltry Poultry Vaccine, we saw a study conducted by the Virology department at St. Jude Children’s Research Hospital that looked at the effectiveness of six commercially available H5 poultry vaccines then deployed in Egypt, and found only one (based on a locally acquired H5N1 seed virus) actually appeared to offer protection. Five months ago, in PLoS One: Effectiveness of HPAI H5N1 Vaccination in Poultry - Indonesia, we saw another study that painted a less than impressive picture of poultry vaccination effectiveness in Indonesia. The authors cited frequent low HI titres in poultry even after three rounds of vaccines, vaccination failures, and warned of silent infections and the generation of new H5N1 antigenic variants. Fast forward to today, and we have a new study published in Nature's Scientific Reports on the efficacy of Egyptian poultry vaccines in light of the arrival (in late 2016) of the clade 2.3.4.4. HPAI H5N8 virus. Many of the authors contributed to the 2012 paper mentioned above, and the results are eerily similar to what was reported nearly 6 years ago. The newly emerging, highly pathogenic avian influenza (HPAI) H5N8 virus of clade 2.3.4.4 was recently detected in wild birds and domestic poultry in Egypt in the 2016/2017 winter season. 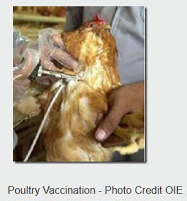 Vaccination based on commercial H5 vaccines is used as an essential control strategy in Egyptian poultry. Here, we studied the efficacy of the eight most common commercial H5 poultry vaccines in the Egyptian market and compared them with an experimental vaccine based on the Egyptian LPAI H5N8 virus that was prepared by using reverse genetics. The experimental vaccine and Re-5 commercial vaccine were able to completely protect chickens and significantly reduce virus shedding. Our results indicate that most of the commercial poultry H5 vaccines used in the present study were ineffective because the seed viruses in these vaccines are genetically distinct from the H5N8 viruses currently circulating in Egypt. Although some of the commercial vaccines protected chickens from mortality, they failed to prevent chickens from shedding the virus. Accordingly, we recommend updating and reinforcing the H5N8 prevention and control strategies in Egypt. 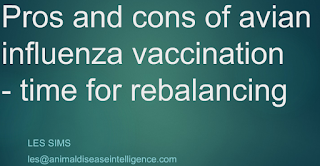 The vaccination strategy should be reconsidered based on currently circulating viruses. The experimental homologous H5N8 vaccine provided the best protection against a challenge with the clade 2.3.4.4 virus. The sera of chickens vaccinated with the Re-5 Merial, Zoetis, EgyFlu, CEVac Flukem and Volvac (B.E.S.T.) vaccines showed reduced cross-reactivity against the Egyptian H5N8 virus and provided ≥ 80% protection, while the Nobilis, ME Flu VAC, and SERA-VAC vaccines did not reach the protection limit recommended by the OIE. The Re-5 Merial (based on a clade 2.3.4 H5N1 virus) vaccine protected the chickens from mortality and reduced virus shedding. Most of the commercial vaccines protected chickens from mortality but did not reduce or prevent virus shedding. This suggests that the circulating H5N8 viruses may evade vaccine protection. The genetic dissimilarity and poor reactivity between the H5 commercial vaccines used in Egypt and the currently circulating H5N8 viruses proves that the vaccines might not be effective in the field or may introduce only partial protection and thus could lead to vaccine-induced escape mutant strains. In many developing countries, poultry and eggs are not only prime sources of badly needed and relatively inexpensive protein, they are often a measure of an individual's wealth. The wholesale culling of poultry, whether commercial or backyard , can have dramatic economic and societal effects (see Iran: Bird Flu, Food Insecurity & Civil Unrest). 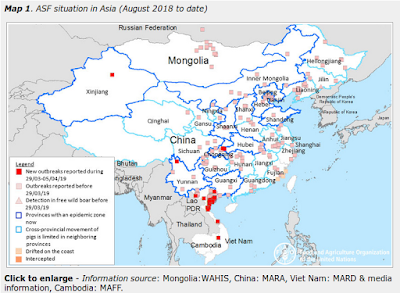 No government is more aware of this fact than China, and so when HPAI H7N9 emerged in early 2017, the decision to go on the offensive with an experimental H5+H7 vaccine was viewed as a matter of national security. While modern AI poultry vaccines hold a lot of promise - and would likely better the lives of millions of people in low resource countries dealing with endemic avian flu - they have to be frequently updated and correctly applied, if they are to be effective. But all too often we see exactly the opposite in the field. Until that changes, and we see more success stories like what we've seen this past year out of China, the global reluctance to embrace AI vaccines will likely remain unchanged.